If she loves the vintage look, she'll adore this show-stopping ring. Set with cool blue aquamarine surrounded by twinkling diamonds, it's sure to capture her heart. 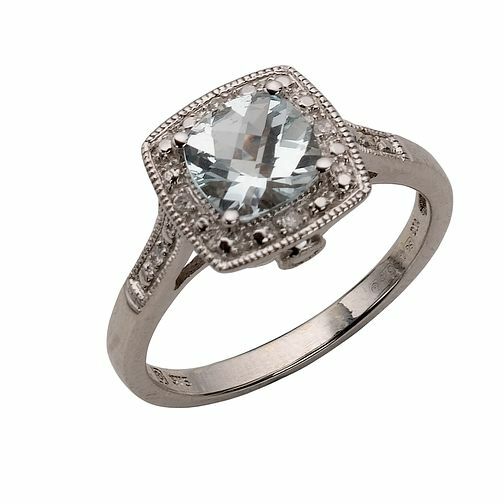 9ct White Gold Diamond and Aquamarine Vintage Ring is rated 4.7 out of 5 by 31. Rated 5 out of 5 by Anonymous from Simply Beautiful I received this as an engagement ring from my now husband, nearly 10 years ago. It's as beautiful now as it was then. Blue is my favourite colour so I really wanted a ring with a blue stone in it. I had the stone replaced about a year ago with a slightly darker and brighter blue, and usually have to get the band dipped as the white gold starts to fade to yellow. However, once it's been done, it looks absolutely stunning...nearly a decade later. Rated 1 out of 5 by Anonymous from price I looked at this ring at christmas as i have been looking for something vintage style ive been looking around since and went back to it today to see it has gone up in price considerably yet it still seems to state it is a sale item ?? makes me wonder how genuine the sale items are .